Michelle D. Deardorff is the Adolph S. Ochs Professor of Government and Department Head of Political Science and Public Service at the University of Tennessee at Chattanooga. 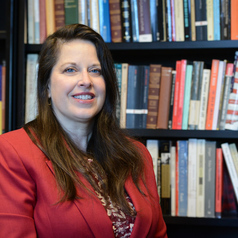 Since earning her Ph.D. from Miami University in 1993, Deardorff’s teaching and research have focused on the constitutional and statutory protections surrounding gender, race, and religion, and well as exploring the insights provided by political theory. Her most recent publication is entitled Pregnancy and the American Worker (Palgrave MacMillan 2016), which examines the lower federal courts’ interpretation of the Pregnancy Discrimination Act of 1978 and the Americans with Disabilities Act of 1990 in relationship to pregnancy protections in employment. The book was coauthored with James Dahl, University of Illinois-Champaign-Urbana. Michelle Deardorff joined the department at UTC in 2013. Previously, she served as Professor and Chair of the Department of Political Science at Jackson State University, a historic black university in Mississippi. Prior to her relocation to Jackson State in 2003, Deardorff was the Griswold Distinguished Professor of Political Science, former chair of the Department of Political Science, and Acting Dean of Arts and Sciences at Millikin University in Decatur, Illinois. Michelle is a founding member of the Fannie Lou Hamer National Institute on Citizenship and Democracy, a coalition of academics who promote civic engagement and popular sovereignty through the study of the struggle for civil rights in the United States. In 2009, the American Political Science Association (APSA) published Assessment in Political Science, a primer on programmatic and classroom assessment within the discipline, co-edited by Deardorff, Kerstin Hamann, and John Ishiyama. Oxford University Press published in 2011 the two-volume set, Constitutional Law in Contemporary America, written by David Schultz, John R. Vile, and Deardorff. Most recently, she joined Brigid Harrison and Jean Harris as an author of the McGraw-Hill text American Democracy Now, released in its fourth edition in 2015. She currently serves on the Council of the APSA.